Adam Schiff is refocusing the House investigation into what is happening with Trump right now rather than the 2016 election, a subject which I imagine he assumes will be addressed by the Special Counsel. Nearly two years into his investigation, special counsel Robert Mueller has not accused any member of the Trump campaign of conspiring with the 2016 election interference effort — and it’s not clear whether he will. Whether Mueller will answer that question in the absence of criminal charges is unclear. But in an interview with NBC News, House Intelligence Committee Chairman Adam Schiff said he is steering his investigation in a new direction to focus on it — and he will demand any relevant evidence compiled by the FBI or Mueller’s team. The California Democrat also expressed concern that Mueller hasn’t fully investigated Trump‘s possible financial history with Russia. “From what we can see either publicly or otherwise, it’s very much an open question whether this is something the special counsel has looked at,” Schiff told NBC News. In fact, most FBI counterintelligence investigations don’t result in criminal charges, experts say, because they tend to involve secret intelligence that either can’t be used in court or doesn’t add up to proof beyond a reasonable doubt. If the FBI assesses that a government official is compromised by a foreign adversary, officials often will quietly remove that person from a sensitive role or wall him or her off from classified information. Trump defenders complain that those who are now focusing on foreign influence have “moved the goalposts” — shifting emphasis to the issue of foreign compromise now that criminal charges involving “Russian collusion” seem less likely. “What Americans should be concerned about is whether the president’s Russia policy is not dictated by our national interest but is dictated by his desire to make hundreds of millions of dollars off a tower in Moscow,” Schiff said. Trump‘s behavior at Helsinki had to make the hair of every Russia counterintelligence agent in the government stand up on end. 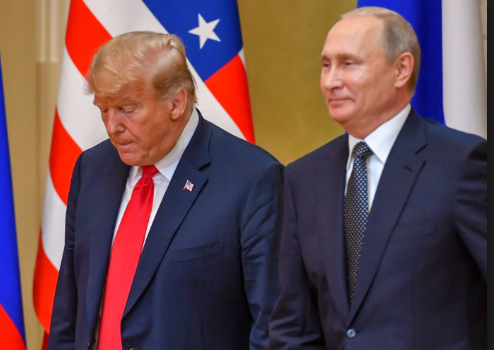 Whatever happened in the campaign, there is something terribly off about Trump‘s relationship with Putin as president. And the fact that “as the president, he has the legal right to spill secrets to whomever he wants” is a very, very big problem for this country and the world.